Offering you a complete choice of products which include wastewater recycling plants and wwtp-waste water treatment plant. We are a prominent Manufacturer, Trader and Supplier of an excellent range of Wastewater Recycling Plants. These are widely appreciated for their superb finish and high quality. When water is used for bathing, showering, washing, cleaning and other household and industrial work, the water outflowing through these tasks is not suitable for re-use in the same purposes. Used water includes many harmful solids or solvents which are to be filtered to such extent so that it can be re-used for different activities such as gardening, farming, construction or other similar. Water polluted through the households & industrial activities are recycled again and again till it become usable for the same purposes or some other purposes.Waste water treatment plants are established to make the water usable by removing harmful contaminants from the dirty water. By discharging the water through the cleaning process, recycled water may be used for agriculture production. 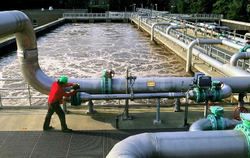 Apart from that, for cleaning the waste water, it must undergo through many process such as, Preliminary treatment, Primary treatment, Secondary treatment and Territory treatment which are all step-by-step processes. Looking for “Wastewater Recycling Plant”?